Adcock had a solid game for the Barnstormers on Saturday in their win. The 7th Grade forward had 16 points as he was really good from the outside hitting 3 of his 7 three attempts and also had 4 strong rebounds for the team. The Spartans had a great day again and Anderson was a key to that success with his play in a couple wins. The first one, Anderson scored 15 points with 3 rebounds as he attacked the rim from the wings and finished well. Another game the quick and tough guard had 17 points, hitting 3 three’s in the game and leading the team in scoring that one. 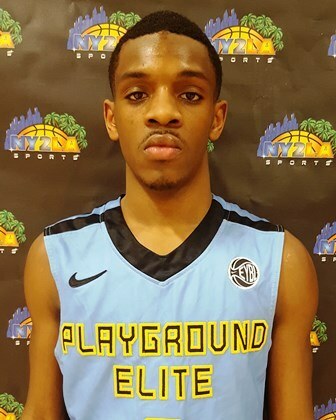 Carrington leads Playground Elite often, but he took it to another level in a couple victories Saturday. The slick young guard got out in transition often and finished lay-ups, he attacked in the half-court and had some nice jumpers that he kissed off the glass, while knocking down some pull-up mid-range shots as well. He had games of 20 points, 3 rebounds and 2 steals the final game, but had 15 points, 6 steals and 2 assists in an earlier game. Harvey had a nice day in a couple different games for PowerGroup on Day 2 of the Championships. The long forward used his athleticism and instincts often to find gaps in the defense and then make plays around the rim, but he also got it rolling from downtown in their later game. Harvey had 10 points and 3 steals one game, while following that up with an excellent 17-point performance where he hit 3-of-7 from three-point land. Hollowaty had a really solid game for 43 Hoops in tough loss on Saturday. The quick young guard scorched the nets for 5 three’s, was fearless getting in for a few rebounds and pressured the ball defensively. Hollowaty scored 19 points with 3 rebounds and 2 steals. Jacobs got it rolling again for Chicago Select with his aggressive takes to the hoop, but then also showed his step-back abilities, stopping and popping from three on occasion. Jacobs had 19 points with 5 rebounds and 2 steals in one game, then doubled his efforts up, putting up 17 points in another contest. Long took a bit to get rolling Saturday, but once he got a feel it was all over for the opponents. With his blend of size and skill on the offensive end, Long hit jumpers, put in a couple short hooks around the blocks and scored off put-backs. The one game Long had 15 points and 11 rebounds, then had another double-double with a monstrous 26-point 15-rebounds effort that he added 2 blocks defensively to as well. Martin added to the Spartans attack with a pair of double-double efforts himself including one unbelievable rebounding game. Martin had 13 points, 10 rebounds, 4 steals and a block one outing, but then put up 15 points with 20 rebounds in another game that put everyone on notice they better keep this young man off the glass. Nau had a really steady day for Ray Allen Select as the smart and heady point guard had 10 points, knocking down 2 of his 5 three-point attempts but also shelling out a pair of assists and getting 5 rebounds. In a loss later in the day, Nau had 16 points, hitting 4 three’s at 50% and pulling down another 3 boards for his team. Reece had a big game for Yanders Law in a tough loss on Saturday. The 6-1 forward had had 4 boards for his team but was most impactful with his offensive efficiency. He got the rim, he scored on some shots and was 10-13 from the field, scoring 22 points. Tyrell Terry helped Sizzle’s 7th grade group to a good win Saturday. The lanky guard hit a couple three’s and was strong in transition getting to the basket and taking contact. Terry finished the game with 18 points and was 4-of-4 from the free throw line. White added to the PowerGroup success on Saturday having himself a huge game in one of their wins. The 5-11 forward was gritty rebounding the ball 8 times, had 5 impressive steals and also had a couple assists in the game. White had 20 points in the game though to pace his team to victory. United got a lift Saturday one game as developing post prospect Kuran Wilson put together a double-double performance of his own. Wilson finished around the rim well and got a few put-backs for his team as well. He finished the game with a solid 14 points and 11 rebounds.